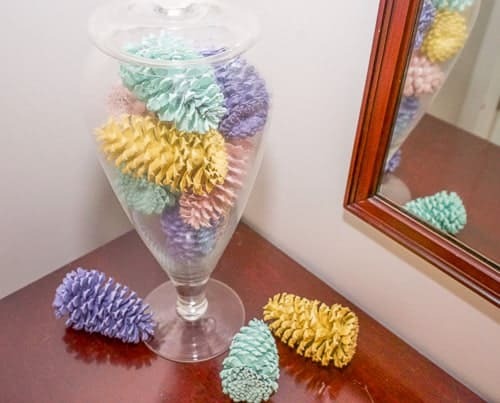 Did you ever collect pinecones as a kid? Or maybe even as an adult? Our next door neighbor has two very large pine trees in his backyard right next to the fence. So, every fall, we end up with quite a few fallen pinecones in our backyard. Pinecones have long been used as autumn and winter decor, but I wanted to do something that would allow me to use some of my backyard pinecones year round. I decided to spray paint some and put them on display. 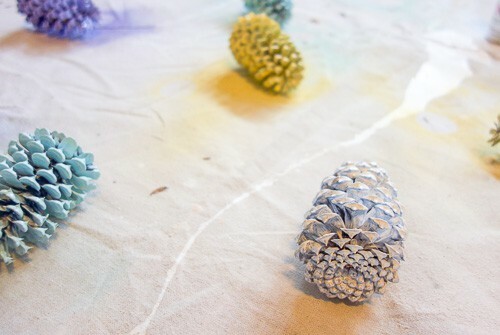 It was incredibly easy to do, and they turned out so pretty, I thought I would share my simple tutorial on how to spray paint pinecones. When I started this project, I had no idea where I was going to display them. My mom had given me a large apothecary jar ages ago that I had never made use of. I thought it would be perfect to fill with painted pinecones, I just didn’t know where I was going to put it. So, I simply picked a few colors that I love and assumed I would be able to find a place for them at some point. Maybe not the best way to go about it, but fortunately, I did end up finding the perfect place. After collecting a number of pinecones from the yard, the first thing I did was soak them briefly, just to make sure that they were clean and critter free. 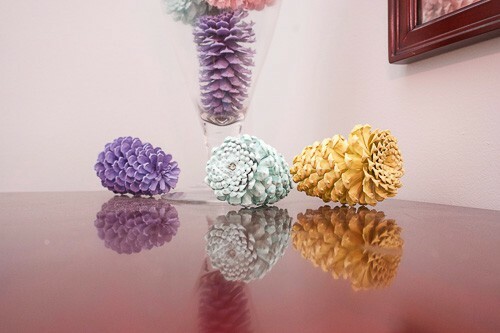 Simply soak the pinecones in a sink full of warm soapy water for 10-15 minutes. Then, lay them out on a towel, or some paper towels, to dry out. Once they are completely dry, it’s on to the painting. I laid out a canvas drop cloth in my garage for this part. At first, I thought it would be best to prop them up for painting. I was afraid if I just laid them down on the drop cloth to paint that they would get stuck and the paint would peel off. So, I cut up a few toilet paper rolls to set them on. I actually found this method fairly difficult, though. 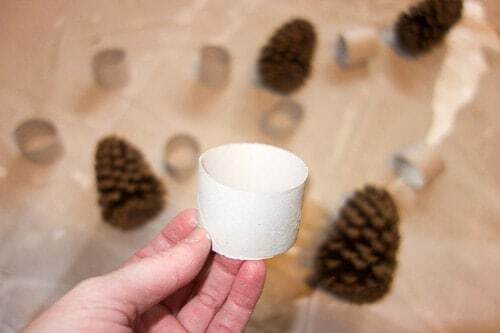 It was tough to get the pinecones to balance perfectly on the paper roll. I also couldn’t get too close with the paint can because the force would knock them over. So, I was unable to really get down into the cracks and crevices of the pinecones. So, after giving them a coat or two, I decided to try just laying them down on the tarp. And guess what? It wasn’t a problem at all! It allowed me to get close and paint down into all of the cracks, and I didn’t have trouble with them getting stuck to the cloth. I chose fairly light, pastel colors. So, it did take a number of coats to cover them sufficiently. After getting them coated, though, and filling up my apothecary jar, I was quite pleased with the result. So, if you are looking for an easy, and unique, craft, this one fits the bill perfectly. So pretty! And you can customize them for any season or color scheme. Cute! Those colors look so pretty together in the apothecary jar. 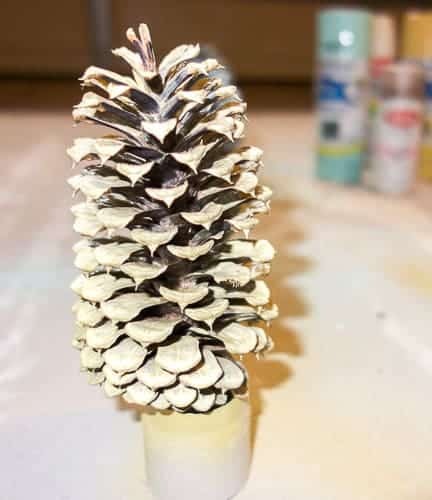 I’ve never tried spray painting pine cones before, and probably would have tried balancing them on something like you did. It’s good to know that it works better if you just lay them flat. Thanks for that tip. You know I have painted pine cones before but with a brush never with spray. But this could be a fast alternative to my slow method. I learned about this from when the kids were little and they’d bring home pine cone crafts from school. Oh my goodness. I can’t imagine doing it with a brush. This was really so fast and easy, even though it did take a number of coats. You should definitely try it next time! Those are so cute, I love the pink! I love the idea of pastel colors! That is something that I never would have thought of since they are so traditionally used in fall decor. I love this. I am even imagining Easter! Thank you! I love the pastel colors, as well. You could really do any color scheme and use them for any time of year. 🙂 I’m just glad that I was able to find a great place for them! 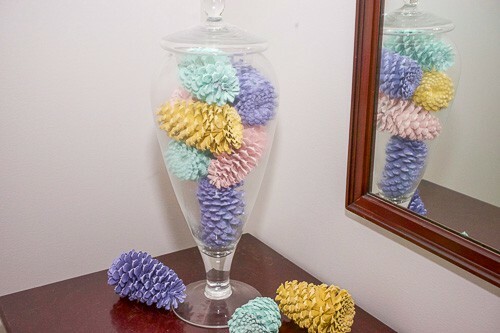 That is a great way to spruce up rooms throughout the year with some color! Or even with some glitter! Yes! I actually originally was going to do some of them as pink glitter, but the paint I purchased was not the best. Maybe next time… Love the idea, though! Thanks for taking a look! Pine-cones are the coolest shapes, aren’t the? Love the texture too. I’ve not thought of painting them and adding them into our decor. I bet these would be really pretty painted white at Christmas time too. How fun. Off to scavenge some pine-cones. And an apothecary jar, they look great inside it!!! Yes! I love pine cones. And I love the idea of doing some white ones for Christmas. That’s a fantastic idea! I may have to collect some more this fall for a winter display. Thanks so much! 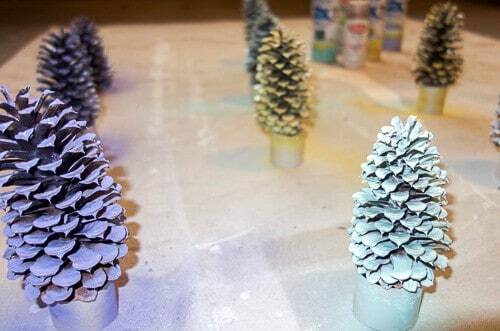 Wow, I really liked this idea of painting the pine cones. it never occurs in my mind that we can even paint them, and the way you make them stand is really cool This is a good project which I can do with my grand children in their holidays. Thank you, Sadhna. I bet your grandchildren would love doing this. What a great idea for a project! 🙂 Thanks so much for the comment. Your pinecones are so bright and happy! A couple years ago, I completely coated about 30 pinecones in gold spray paint. While the results were gorgeous, I was surprised how many cans of spray paint I actually needed. Thanks so much for sharing at the #happynowlinkup! Ha! 30 pinecones is a lot! And they do need a number of coats to get them thoroughly covered, don’t they? I’m sure yours looked amazing. Sounds like great Christmas decor. 🙂 Thanks for looking and for hosting! These are amazing!! You could do them to accent any room or holiday. Thank you! And you’re right! You could use any color scheme, and you could also get creative with what to display them in. Super easy, and cheap, decor! This craft project turned out beautifully. 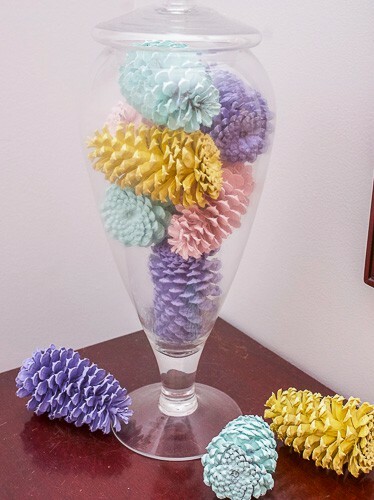 I love pinecones and I particularly like the pastel colours you chose. They look so pretty together in that apothecary jar! I love the colors! We also have pinecones that fall each year but, they’re kind of skinny and strange looking. Lol! Maybe a coat of paint would make them cute! Ha! A few coats of paint can spruce just about anything up, right?! Thank you for looking!